It's easy to save cash with Bukovel vacation packages on Expedia. You'll have heaps more time to work out the exciting stuff — and more spending money! Savings of up to C$590* are waiting for savvy vacationers who secure a package deal on Expedia. With just a few clicks, you can arrange everything you'll need for your next vacation via our exhaustive database. And — with more than 400 partner airlines and 321,000 properties from around the world, you'll have the freedom to mix and match! Itinerary need a little padding? Bukovel vacation all arranged but no idea what's on the cards when you arrive there? Let us make it easy. Eager to add some deeper meaning to your trip? Take yourself on a pilgrimage to St. Demetrius Church. Regardless of your beliefs, it's a fantastic place to observe and find out about the local faith. There's an excellent range of things to keep you busy close by. There's nothing like the thrill of gazing out at a blanket of powder snow and knowing you've got an entire day ahead to take to the slopes. Slip into your jacket and put on your skis — Bukovel Ski Area awaits! Still have some time on your hands? Whether you're a seasoned professional or an amateur, it's time to get out your skis and tear up the slopes. Vorokhta Ski Resort guarantees fun for all skill levels! After cheap vacations or luxury getaways in Bukovel? There are just 2 properties to pick from, so be quick! Expedia can help you out. 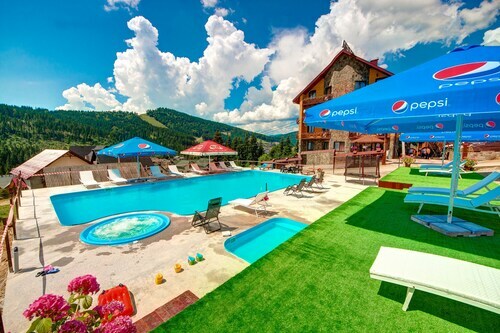 Check out the Radisson Blu Resort Bukovel (Polyanitsa Village) and the Park Hotel Fomich (Urochishe Vyshnya 13V). These popular properties not only come with comfy beds — they come with good reviews as well! There's nothing like finally arriving at Ivano-Frankovsk International Airport (IFO) after being stuck in a cramped cabin for hours. After you've grabbed your baggage and had a good stretch, you'll find yourself just 40 miles (64 km) from Bukovel's main streets. This family-friendly Bukovel hotel is located in the mountains, 1 mi (1.6 km) from Bukovel Ski Area, and within 9 mi (15 km) of Prut River Park and St. Demetrius Church. Vorokhta Ski Resort is 12.4 mi (19.9 km) away. Situated in Bukovel, this hotel is 0.9 mi (1.5 km) from Bukovel Ski Area and within 12 mi (20 km) of St. Demetrius Church and Prut River Park. Vorokhta Ski Resort and Probiy Waterfall are also within 25 mi (40 km). 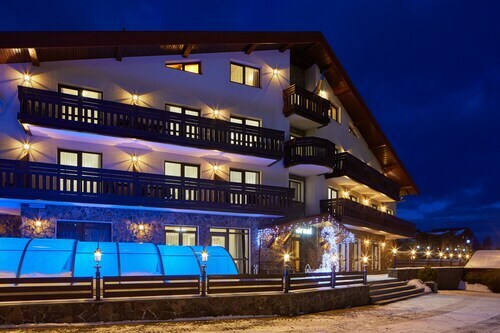 Conveniently located near the ski slopes, this Bukovel hotel is 1.2 mi (2 km) from Bukovel Ski Area and within 16 mi (25 km) of Vorokhta Ski Resort and Prut River Park. St. Demetrius Church is 8.5 mi (13.7 km) away. Situated in Bukovel, this hotel is 1.1 mi (1.7 km) from Bukovel Ski Area and within 12 mi (20 km) of Prut River Park and St. Demetrius Church. Vorokhta Ski Resort and Probiy Waterfall are also within 25 mi (40 km). 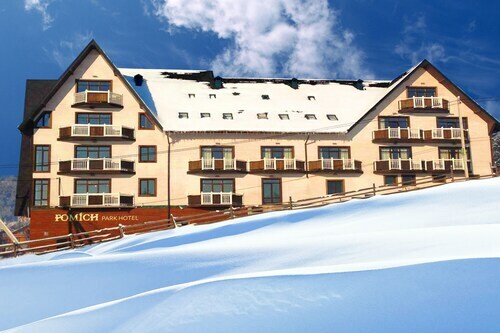 Situated in the mountains, this hotel is 1.2 mi (1.9 km) from Bukovel Ski Area and within 9 mi (15 km) of St. Demetrius Church and Prut River Park. Vorokhta Ski Resort and Probiy Waterfall are also within 25 mi (40 km). Situated in Bukovel, this hotel is 1 mi (1.6 km) from Bukovel Ski Area and within 9 mi (15 km) of Prut River Park and St. Demetrius Church. Vorokhta Ski Resort is 12.4 mi (19.9 km) away. 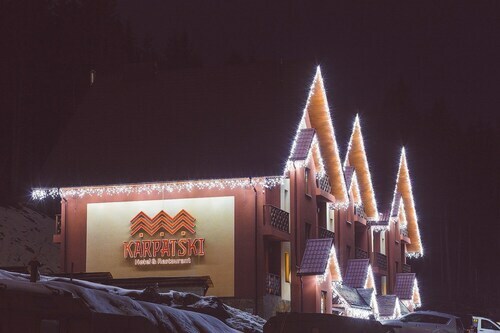 Situated in Bukovel, this hotel is 10.2 mi (16.5 km) from Bukovel Ski Area and within 20 mi (32 km) of Prut River Park and St. Demetrius Church. 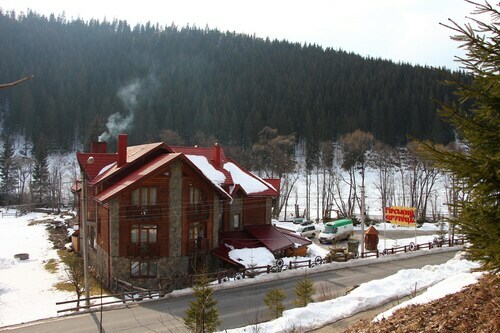 Vorokhta Ski Resort and Probiy Waterfall are also within 32 mi (52 km). Karpats'ka, 5A, Bukovel, Ivano-Frankivs'ka obl. 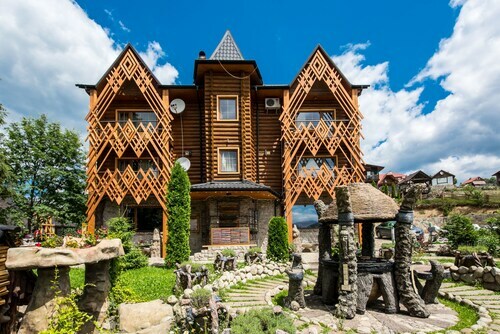 Situated in Bukovel, this hotel is within 6 mi (10 km) of Bukovel Ski Area, Prut River Park, and St. Demetrius Church. Vorokhta Ski Resort is 9.9 mi (15.9 km) away.